Gosh! Have you ever marvelled and shaken your head at the ease with which the child version of you was made a fool of? I do! Seems I was a rather happy-go-lucky and trusting child, willing to believe almost everything the parents told me. And when it came to food – and yes, I was born a food worshipper – everything the parents said was taken as the gospel truth. Probably the reason why Maa got away with convincing me that the elephant foot yam curry and the raw jackfruit curry that she would make often were actually meat curries. Seems I was rather demanding a food lover and wanted “chicken” every day. Not a very good idea in a city where the temperatures leaned towards hot more than the cold. Digestion issues and all that stuff, pointed out Maa when I glared at her for lying to the child me. Luckily for the mother (and me! ), I fell in love with both these dishes and have relished them since. So when Maa’s returned from a shopping trip the other day with a chunk of elephant foot yam and declared “it’s time you learned to make this”, I was happy to enter the chicken. While the raw jackfruit is not as easily available in my city, the elephant foot yam is often found at the corner vegetable shop or the roadside vegetable vendor. 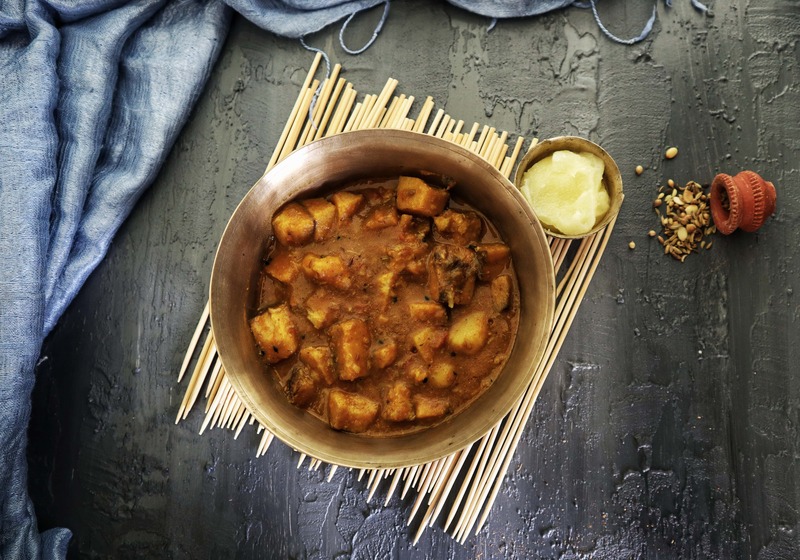 Today’s recipe is the classic Bengali-style ‘ol daalna’ or elephant foot yam curry. ‘Ol’ is the Bengali word for elephant foot curry that is called suran in Hindi and Gujarati. Cooked until the yam (coz elephant foot yam is quite a mouthful) is tender, this curry resembles the Bengali mutton curry in taste. There can never be a substitute for the latter but don’t underestimate this curry either. Yam is said to have several health benefits too, especially when eaten sans the spices. There have been times when we’ve boiled the yam, mashed and seasoned it with salt/ mustard oil before eating it with some steamed rice. Yes it’s an acquired taste but not something to scoff at. Perhaps someday, I shall share with you a list of all the vegetables that we like to eat the simple way – boil, mash, season, mix with rice, gobble. Until then, why don’t you try making this curry and let me know how it turns out? Oh! Hold on! I also wanted to tell you that From The Corner Table is on Facebook (click here), Instagram (click here), Pinterest (click here) and Bloglovin (click here). Do follow, subscribe, like and give me some love. Elephant foot yam cooked in traditional Bengali spices and mustard oil. Peel and cut the yam and potato into cubes. Finely chop the tomato and set the vegetables aside. In a kadhai or deep pan, heat the mustard oil. Add the paanch phoron. As soon as the spices sizzle, add the cubed yam and potatoes. Add the tomatoes, salt, turmeric powder, cumin & coriander powder along with chilli powder. Mix well, cover with a lid and cook on low flame. Stir occasionally until the yam is cooked; poke a piece of yam with a knife or fork to check this. Add a cup of hot water, stir well, cover and cook till the yam has softened. You should be able to comfortably mash a piece. If needed, add another half a cup of water to the cooking vegetables. Remember, you need the curry so don’t let the water dry completely. Once the yam is cooked as mentioned above, check the curry for salt and chilli. Adjust if needed. Whisk the cornflour in a tablespoon of water and pour into the curry. Stir quickly to ensure there are no lumps. Simmer for a minute and remove from the flame. Add the ghee and garam masala to the curry. Mix well and serve piping hot with chapatti or steamed rice. Substitute mustard oil with ghee or any other vegetable oil. DO NOT add ginger to a yam dish; the dish will turn bitter. Cooking time will vary depending on the quality of the yam and the quantity; you can cut down on this by cooking the yam in a pressure cooker prior.